A growing number of people believe that the flora in your gut influences your health, even to the extent of causing cancer. Researcher Dr Si Ming Man has proved them right, with a study linking gut flora in mice to tumours. But it’s not that simple. Dr Man, a cancer immunologist who has recently returned to Australia to set up a laboratory at The John Curtin School of Medical Research, has found that there is a genetic link to the disease as well. His findings show it’s a combination of boosting the activity of a protective gene and increasing healthy gut flora which may slow the progression of colorectal cancer or even prevent it. Australia has one of the highest rates of bowel cancer in the world. Each year one in thirteen Australians will be told they have bowel cancer and around 4000 will die, making it the second biggest cancer killer after lung cancer. Dr Man and his colleagues at St Jude Children’s Research Hospital, Tennessee, found that an immune system protein called AIM2 plays an important role in colorectal cancer. 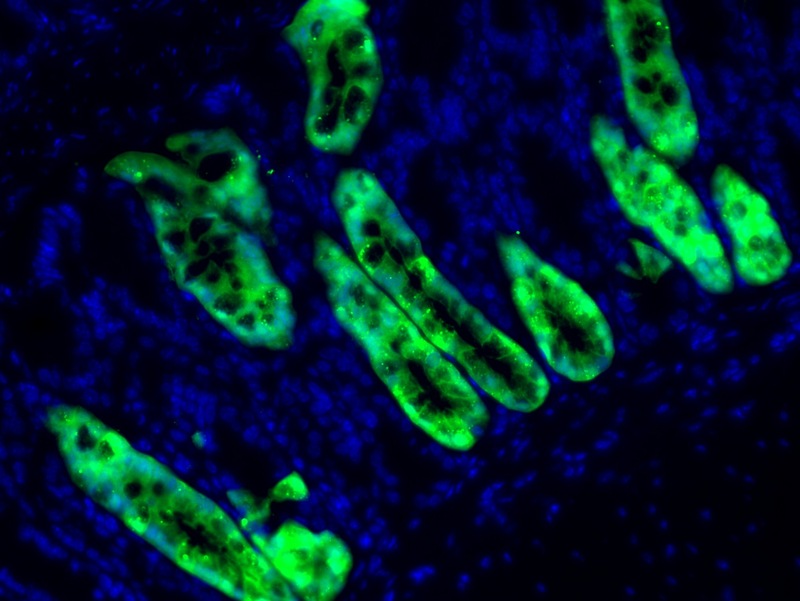 They showed AIM2-deficient mice were hyper-susceptible to developing colon tumours. And they also found AIM2-deficient mice developed more tumours if they had an imbalance in gut flora. Previous studies have found that AIM2 mutations were found in patients with colon cancer, and AIM2 expression is lost in two out of three colorectal tumours in humans. “However we don’t know why the level of AIM2 is reduced in patients with colorectal cancer,” says Dr Man. The researchers induced inflammation in the intestinal tract of mice and then observed how many tumours developed in the intestine. “We were excited to find that AIM2 prevented inflammation and the development of tumours in the colon,” says Dr Man. Intestinal stem cells are known to be the origin of intestine cancer. The research team were also interested to know if gut microbiota influenced the development of colorectal cancer. First they compared the microbiota of AIM2-deficient mice with normal mice and found it to be vastly different. However when AIM2-deficient mice were housed together with normal mice there was a striking reduction in the development of colon tumours compared with AIM2-deficient mice that lived on their own. The normal mice also started to become susceptible to tumours, suggesting that they were influenced by the gut microbiota from the AIM2-deficient mice. “We concluded that AIM2 maintained a healthy gut microbiota which prevents the development of colorectal cancer,” Dr Man says. However, co-housed AIM2-deficient mice still had more tumours than co-housed normal mice, leading Dr Man to conclude that it is a combination of genetics and environment which results in tumour development. These results are a boon for patients with colorectal cancer. Dr Man explains that polyps taken during a colonoscopy could be analysed for AIM2 expression, providing patients with a more detailed prognosis. And there’s even better news, he says. “Transferring healthy microbiota or a group of good bacteria to patients with colorectal cancer at the early stage of disease may prolong survival. Published in The John Curtin School of Medical Research Highlights 2017.